Telugu Titans broke their 2-match winless run with a spectacular 44-28 win over Bengal Warriors. Meraj Sheykh led the home side again and they were completely dominant against Bengal Warriors. Mahendra Rajput put up a lone fight for the visitors, but it was all in vain. The home side showed their intent at the start of the match itself when Rahul Chaudhari returned successfully from the first raid of the match. Jang Kun Lee levelled the score in the next raid, but that was all the Warriors could manage in the first 5 minutes. The Titans, with the help of Rahul and Deepak Nivas Hudda, took a 6-point lead (7-1) as Hadi Oshtorak manned the defence for the home team. Mahendra Rajput put up a fight for the visitors by winning 3 points in the next 2 raids when he was the only Warrior left on the court, but the Titans strengthened their defence as youngster Sandeep came to the party with a couple of sensational ankle holds and the home team completed the first all out of the match. In the 6th minute, all of the Warriors players were tagged out when Jang Kun Lee was caught during a raid as the scoreline read 12-4 in Telugu Titans’ favour. The home team did not let their foot off the accelerator and kept on increasing their lead for the rest of the half. The visitors suffered another all out, this time in the 18th minute when Nilesh Shinde was caught by the 18-year-old Titans defender, Sandeep. With this all out, the Titans increased their lead to 25-8. A couple of points to the home side and a solitary point to the Warriors were awarded before the end of the half. With the Titans leading 27-9 at half time, Bengal Warriors were staring at yet another defeat, but they could take comfort from the fact that the Titans were outplayed by the Jaipur Pink Panthers in the second half a day ago. Coach J Udaya Kumar, however, made sure that the crowd witnessed a win for the home team for the first time this season. Mahendra Rajput was the lone fighter for the Warriors as Telugu Titans continued their commanding performance in the second half as well. In the 22nd minute, Mahendra clocked up 2 more points to make the score 28-11. However, the home team did not let the opposition come back in the match by picking up points consistently. By the 29th minute, the Titans had extended their lead to 20 points as they led 35-15 when Sukesh Hegde returned successfully from his raid. 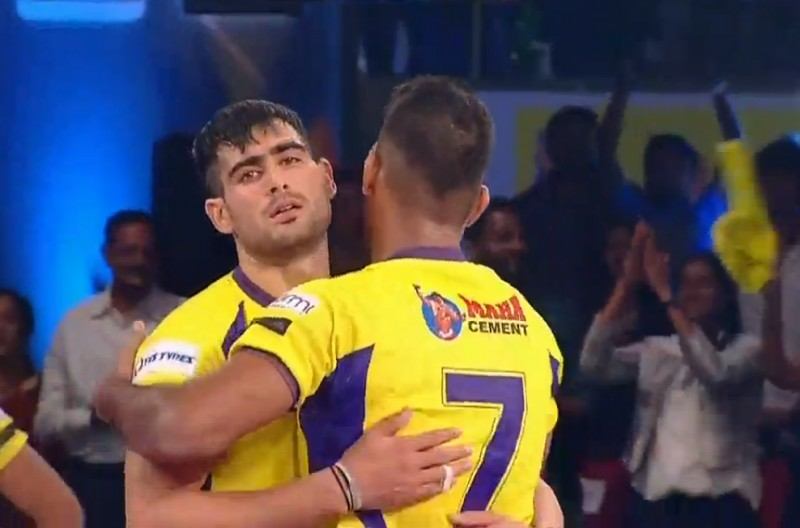 A couple of dull minutes ensued in the match as both the teams exchanged points, but Rahul Chaudhari, in the 35th minute, came up with the raid of the match by getting 3 Bengal Warriors players out. Deepak Nivas Hudda was caught by Bengal Warriors in a super tackle and Mahendra Rajput came up with a super raid of his own as the away team reduced Titans’ lead to 16 points. Both the teams exchanged points till the end of the match as the Titans ended their 2-match winless run in style. They will now face Patna Pirates tomorrow, while Bengal Warriors take on Bengaluru Bulls in the 8 pm match on the same day. Deepak was the star of the match as he put up a solid all-round performance by amassing 5 raid and 6 tackle points. Rahul Chaudhari supported him ably with 10 points of his own. Mahendra Singh Rajput scored a mammoth 14 points for his team, but in a losing cause.